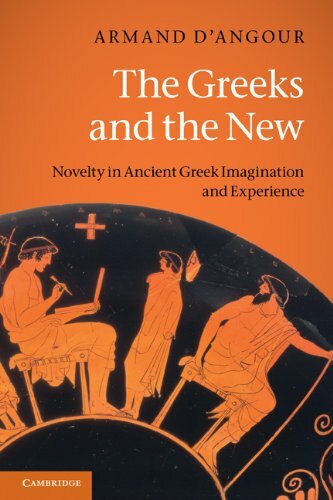 My book The Greeks and the New: Novelty in Ancient Greek Imagination and Experience (CUP 2011) shows on its cover part of a drinking-cup painted in around 470 BC. A school scene in ancient Athens, with a boy holding a laptop on his left arm and a stylus in his right hand. A laptop! In this case, a folding wooden writing-tablet (deltos), the inside covered with a layer of wax on which letters were inscribed. The tablet looks uncannily like a modern notebook PC, and some viewers have thought the image to be a spoof. But it’s genuine, and represents an invention even more far-reaching than the laptop — that of the alphabet. In the fifth century BC, the alphabet was still taught mainly to an elite class. But its simplicity and economy made it a truly democratic technology, unlike, say, Egyptian hieroglyphs or Sumerian cuneiform. By the 4th century BC alphabetic literacy was widespread in Greece. ‘Alphabet’ derives from alpha beta, the names of the first two alphabetic letters — otherwise meaningless in Greek, but originally derived from the Phoenician words alif – ox and bet — house. These words indicate what the earliest letter-shapes were used to depict: picture in your mind the pointy head of an ox seen from above, with its horns trailing behind, as it walks up the field pulling a plough — A. Around 800 BC the Greeks — possibly one man, named Palamedes in Greek tradition– modified the Phoenicians’ script by establishing regular vowel-symbols (A E I O Y) to create the world’s first true alphabet. This alphabet economically and comprehensively permitted the accurate phonetic transciption of a potentially infinite number of thoughts and propositions. One form of this alphabet was eventally adopted by the Romans to become the Latin alphabet used all over the world today. The story of the alphabet’s creation in Greece demonstrates a common and productive mechanism of innovation: the creative modification of an existing structure to fulfil a perceived need.